Planning anything with my friend Linda is like an overload on the idea of having ‘eyes too big for our stomach’, only it’s not about eating too much (well, sometimes it is, but I’m not getting into that right now). It’s about thinking we can fit 68 hours of activity into an afternoon–with time to spare! It happens all the time. Like the year we decided to pick blueberries on a day when the temperature soared over 100 degrees. But why stop there? We brought the berries home (to a non-air-conditioned house) and proceeded to make blueberry scones and blueberry coffee cake. All before we started in on dinner! This past October, we decided to can boxes of green beans, beets and carrots, while attempting to make an ‘early’ Thanksgiving dinner with most of the trimmings (including pumpkin pie and homemade rolls). Not crazy enough yet? Well, it happened to be on the same evening a group of 20-30 teenage boys and leaders came over to play paintball and cook 10 pizzas in the same kitchen we’d already maxed out! We never learn from these enthusiastic planning times. We just keep planning them! Andi and Geoff's apple centerpieces at the wedding. 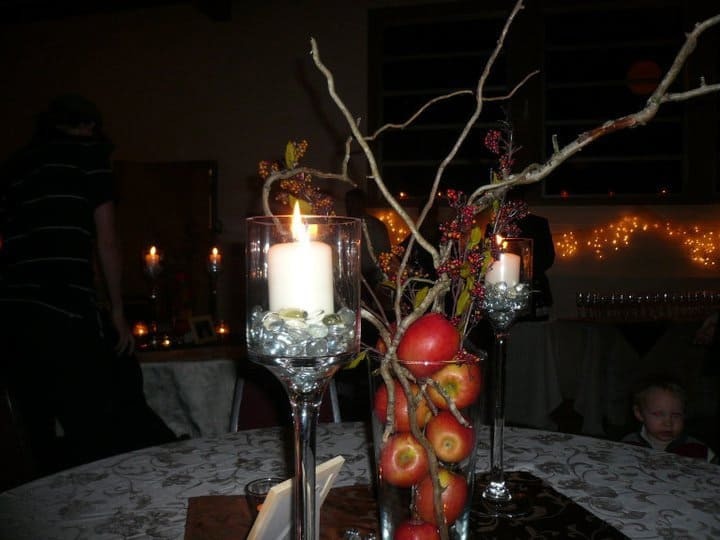 Recently, Linda’s daughter, Andi, used fresh apples as centerpieces and accents at her wedding. Linda purchased apples wholesale from an orchard out in the Gorge and with the help of friends, decorated the church and reception hall beautifully. With the wedding over, I stuffed my car full of boxes of apples and brought them home. Linda and I planned on turning the apples into applesauce, pies, fritters, and crisp in the afternoon before taking a niece and nephew to a living nativity later in the evening. Oh, and we also rented a Christmas movie to watch while we relaxed after it was all over! 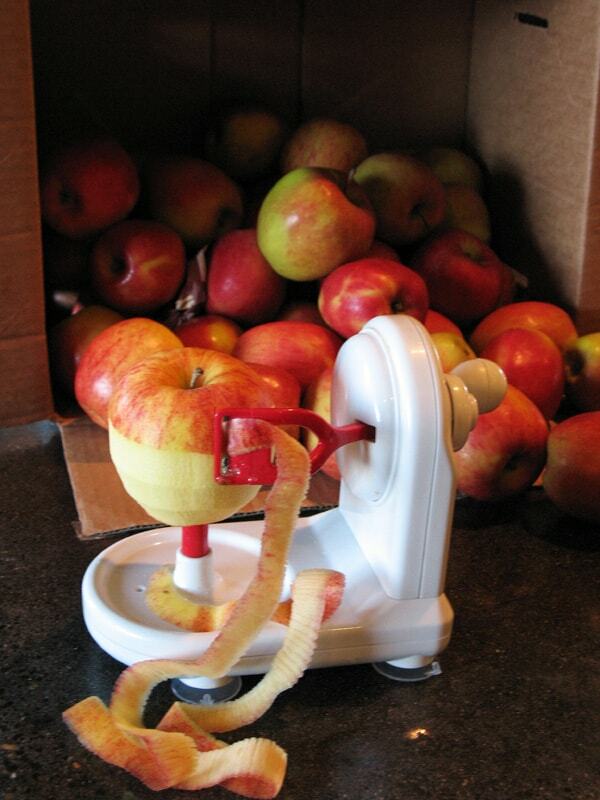 Once again, we bit off way more than we could chew…so far it’s taken TWO days to can MOST of the apples and to make some terrible tasting apple fritters. 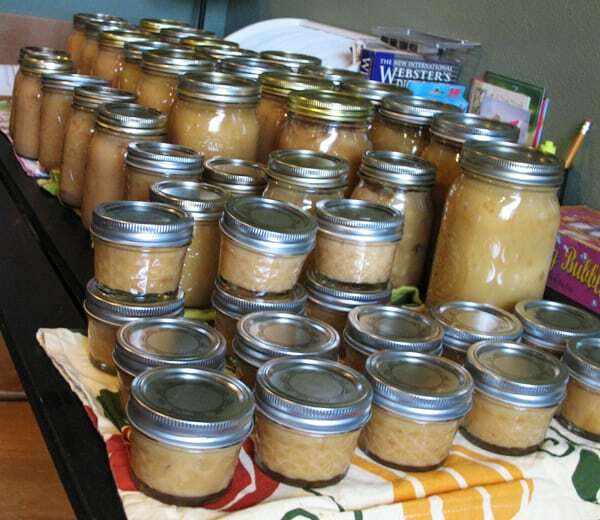 Tomorrow we hope to finish the last of the apples by making apple pie and apple crisp filling to freeze. And, oh yea, and we also want to make a couple of those apple pies along with some apple turnovers. And while we’re at it, we still have that Christmas movie to watch! Okay, so we’re slow learners…but we make tons of memories that we can laugh about for years to come…even if those planned events almost kill us sometimes. Most importantly, we have fun in the process!